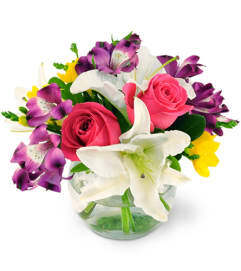 For a fabulous birthday surprise, let our festive Birthday Bliss Bouquet do the talking! 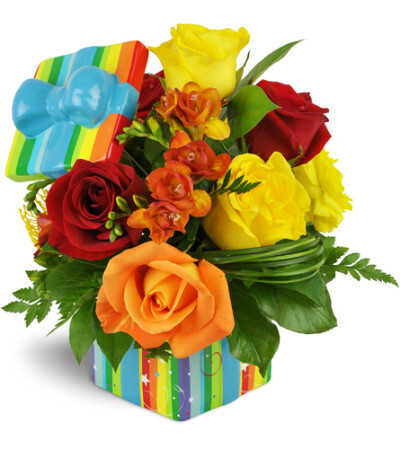 This colorful gift-shaped floral arrangement is super fun for all ages and features red, orange, and yellow roses and orange freesia. 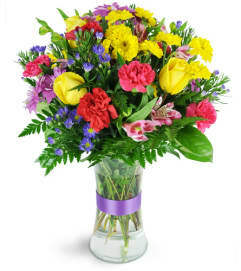 For a gift that keeps on giving, this stunning bouquet is presented in a reusable ceramic "birthday gift" vase, complete with a bow-decorated lid! Big red, orange, and yellow rose blooms are accented by beautiful orange freesias, overflowing a brightly painted square ceramic birthday-present vase.